Sports injuries are quite popular as accident are difficult to avoid. What can be done however is pick the right products and accessories available in the market to help you prevent avoidable injuries where possible and then, in the event of facing such problems, you could be acquiring accessories that could speed up recovery for you. Arm slings are one such group of accessories that are popular everywhere. 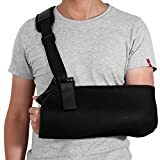 Instead of settling with basic and poor looking arm slings supplied by your medical practitioners, you may want to go for those designed to enhance your spirits and boost your morale while you may be going through the difficult face of recovery when having faced issues with your arm. 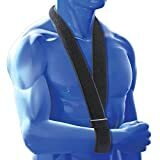 Below you can find some of the best arm slings available in the market to help you quicken recovery from any injuries you may have sustained to your upper limbs. 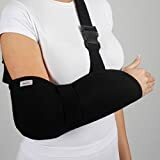 ONE SIZE & UNIVERSAL - Fully adjustable and designed to support and protect the arm and shoulder (fits left or right arms). 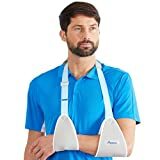 Quanquer arm sling supports the arm for recuperation from subluxation, dislocation, fractures, sprains or surgery of arm or hand. Long enough strap can be cut to meet the personalized needs. Ideally sized for both adults and youths to fit either arm. 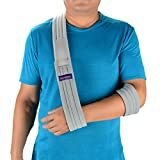 The arm support brace made of brushed cotton padded with soft pressure-reducing materials is very light, flexible, and comfortable to wear. Front-facing magic tape adjuster provides easy one-handed adjustment, so easy-to-use. To immobilize the arm-shoulder in post-operative resting positions. Made of sponge laminated with terry cloth in the inside and flocculent fabric in the outside. Comes with an adjustable neck-shoulder and a waist strap.